My Romance Trading Cards -- here. I'll be handing these out at the RT Convention and at RWA National. I don't know which one is going to be more popular -- the realistic or the manga style. ETA: I wanted to do one for my Adrian, but I haven't really got my act together for this yet, so I won't be handing out an Adrian trading card at RT. I tried out a manga version -- no dice on this so far. I don't have enough dpis or something on my anime picture. I will give this some more thought in April. Cool! I love those. Me, I go for the realistic. Manga doesn't do it for me. Probably something to do with my age. What a great idea. The one for Forbidden Rose and the one's for Katie's books are wonderful. Unfortunately I won't be at national this yr. I realized after saying I "studied" your books on FB, you might fear a stalker. No worries. I'm a friend of Katie Dubois (Katharine Ashe) and a big fan of your writing. No harm intended except to copy your style of deep POV. I do not actually have these 'in hand'. We will see what they look like in person. The Kid has these for . . . hmmm . . . I realize I do not actually know why she has these. They are very small. I suspect one will not be able to read all the lovely writing I have put on them. Ah well. When they become cards-in-esse instead of cards-in-posse, we will see. I don't know Katharine Ashe in person but am hoping to meet her at RT. I study lots of people's writing, meself. I will go back and see what her cards look like. I was admiring several of them, both realistic and manga-style. We will see what the readers think. That is my Doyle. I do like him. Very cool. If you have any left over, may I have one (or three)? They're gorgeous!! I've seen Meljean Brooks', and I know Jeannie Lin's working on some...what a great idea!! You can see Jeannie Lin's at the site linked above. Hmmm ... I think I will add the last one to this page also. But I still want Forbidden Rose to win. Heh heh . . . I put up a blog about this. Trial by Desire is actually a book I read with a great deal of interest. TbD and FR both deal with the theme of 'man versus law'. Both are women fighting an unfair power structure. Eerie parallels. very nice cards. I like Adrian's and all of them. I may not be able to do the Adrian card that way. Something about the quality of dpi or something . . . It all gets very technical. I might be able to find another photo . . .
Not sure I can get it done for RT Conference, but maybe for RWA National. I love the cards. Did you get to pick out the photos of the people yourself? Are these pretty good ideas of what Marguerite, Doyle etc. look like to you? Yes indeed. I got to pick the photos. Do they look like Doyle and Maggie . . . ? I don't want to tell folks what the characters look like. That's something everybody gets to decide for herself. So I picked photos that just give the impression of the character. Somehow I missed these. Seeing Adrian identified as an assassin by profession hurts my heart a little. Not that I didn't know he'd killed a lot of people, and with gay abandon, but being sent out to do the deed has to mess with his head -- I hope. It's a long road from sociopath to hero! I did a card with a realistic photo face. I'll try to get around to posting it here when I have a free moment. I don't remember what the wording was, but I think it was similar. He did assassinations for Lazarus -- largely a matter of dealing with other gangs. 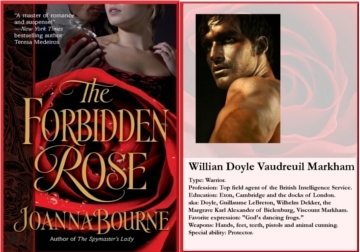 When the British Service got hold of him, they didn't send him out to kill -- remember in Forbidden Rose when we see him sparing a Frenchman's life because Doyle wouldn't like blood spilled. It's one of those Catch-22 deals. The Service wouldn't let Adrian kill till he'd developed enough of a conscience that he didn't want to. I have to deal with this transition in Black Hawk. It's always seemed to me that Adrian could have killed Pax if he'd wanted to, but he had Doyle's voice in his head. Lucky for Pax. Looking at it historically -- the British in 1800-ish, did not go in for political assassination. When the British were approached by a French Royalist group and learned of a plot to assassinate Napoleon, for instance, they warned Napoleon. The British considered assassination unsporting and unethical. The British Service, therefore, does not send out political assassins. They are more an intelligence gathering and analysis group. Sometimes they kill people though, not being unreasonable about practicalities. Carruthers is particularly ruthless. The French -- the Royalists in particular -- did rather go in for political assassination and made several lively tries to dispose of Napoleon. Adrian could have killed Pax. Yes. No doubt of it. He got himself hurt NOT killing Pax. And in the months and years after that meeting, Pax figured out that he'd been spared. Since you mentioned Pax I figure it gives me an opening to wiggle in and ask some questions related to him and "Black Hawk." Is he someone we will see in the new book? Is he also related to Galba in some way? 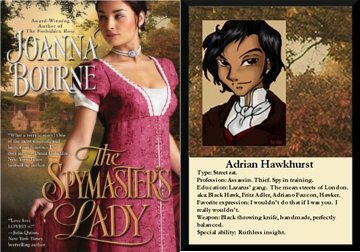 In one book you mention him as brown haired- is this a disguise as he goes off spying? Is he someone that may get his own story someday? Pax is an important secondary character in Black Hawk. We learn quite a bit about him. He's not related to Galba, though they both have light colored hair. Pax's natural hair color is pale blond. Almost white. That's an easy shade to disguise, and he often does. I haven't really thought to what I'll do after Black Hawk. There's this great yawning gap just waiting to be filled . . .